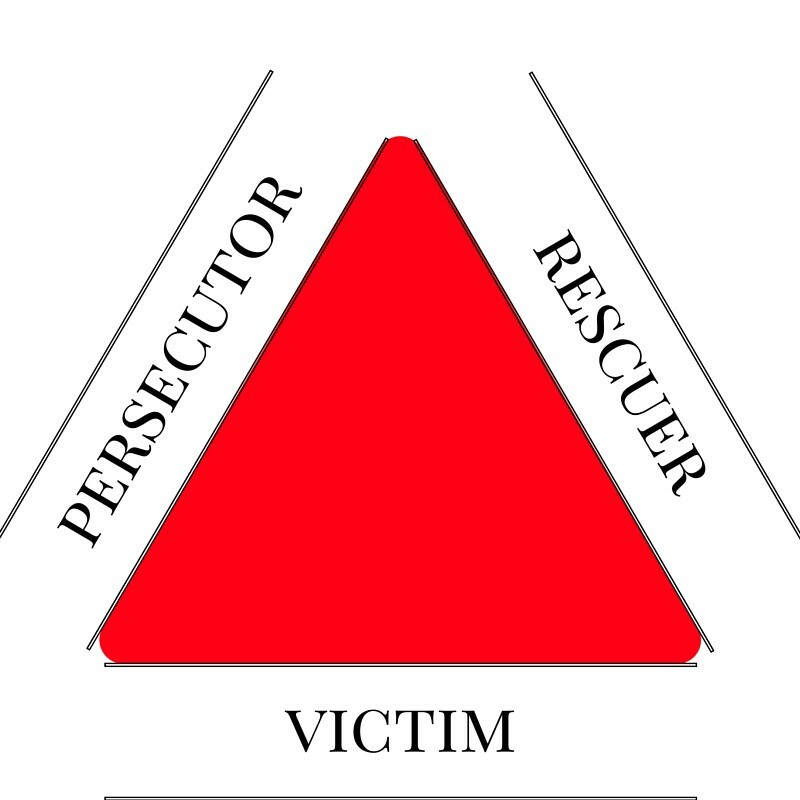 The Drama Triangle, pictured to the left, has three available roles: persecutor, rescuer, and victim. And it is my assertion that regardless of which role one chooses to step into, one is perpetuating violence. I know this is an unorthodox claim. At first glance, it seems insane. How is a victim perpetuating violence? How can their rescuer be perpetuating violence? Isn’t the victim innocent, and, well…a victim of violence? And isn’t the rescuer noble? Aren’t they stopping violence? These are excellent questions, and to really dive into them, we need to define exactly what it is we’re talking about. What is violence? What is power? And, perhaps most importantly, what is the distinction between the two? The more definitions I read, the more blurred the distinction gets. 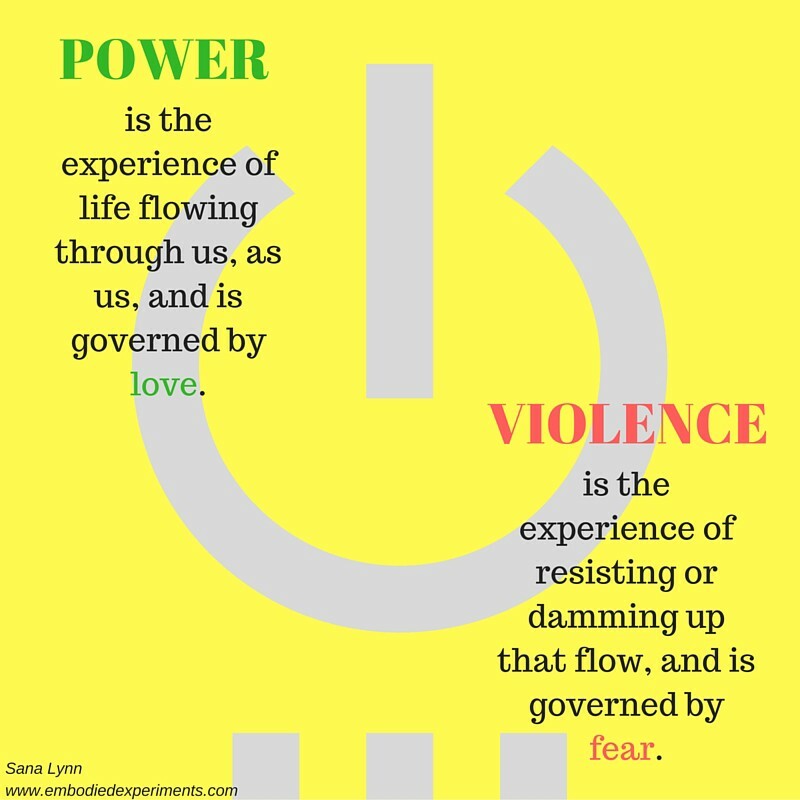 How are violence and power related? If to be powerful is to exert force, and violence is swift and intense force, does power = violence? If to be violent is to be very strong or powerful, does violence = power? Or is it possible that we are simply very, very confused? So, in terms of language, it is very difficult to tell the difference between power and violence. The more definitions I read, the more etymology I uncover, the more muddled the picture becomes. I believe that this is because we have a deep misunderstanding of what true power is, and that,in reaching for power, we inadvertently perpetuate violence. Read it again. Take it in for a moment. Take a breath. I’m going to write more about where I got those definitions in a future post, and unpack what I mean by them and how understanding them can bring big changes to our lives, but for now, I just want you to have them in the back of your mind as we return to the Karpman Drama Triangle. Persecutor. Victim. Rescuer. Three separate roles in the cycle of violence, each one motivated by fear, and each one either avoiding or clinging to that fear, and so perpetuating violence. There are myriad options and variations that can play out within this cycle, all different combinations of resistance and clinging, but for the sake of clarity for now I’ll illuminate only the most common variation of how this triangle plays out. Wait — what just happened there? Somehow the rescuer ended up saying the same thing as the persecutor! This is exactly what plays out in this cycle — no matter which of the many variations of clinging and resisting are at play, the violence only grows. See, as soon as the rescuer steps into the persecuting sentence, the original persecutor feels victimized. And the response is either to continue to persecute the original victim (often more vehemently), or to step into victiming themselves, or to turn on the rescuer, who then feels victimized… and it continues on, and on, and on. At each step, the fear increases. Because no one is willing to feel it. Wait a minute, you might ask… isn’t the victim clinging to fear? How can you say they aren’t feeling it? And that’s an excellent question, and a tricky one to answer. The short version is that no, clinging to fear and feeling fear are not the same thing at all. Clinging to fear says “It’s a scary world, and I am not safe in it.” Feeling fear says “I am afraid.” It’s subtle, but it’s there — the first sentence, the clinging sentence, is a distancing of oneself from the actual emotion. It’s projection. It’s blame. It’s story. See, it all comes down to what the fear is about. As long as the victim is saying “It’s a scary world, therefore I am afraid,” the victim is separating themselves from that which they fear. “It’s in the world, it’s not in me”. The rescuer is playing a similar game — “The persecutor started all of this, the victim is right to be afraid, therefore I will rescue”. Again, the thing to be feared is the “other”; the “not-me”. Here’s the thing: nobody sees themselves as the persecutor. 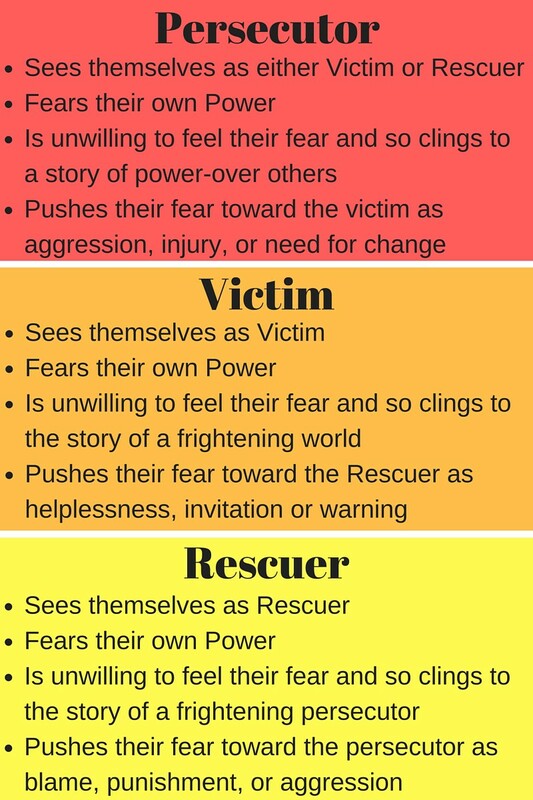 Everyone sees themselves as either victim or rescuer. Everyone projects “that-which-is-to-be-feared” outside of the self. And everyone is actually afraid of something within. So what is it inside each of us that has us so afraid that we can’t even admit it to ourselves, let alone feel it? More on that next week; in the meantime, your comments and questions keep me thinking and inspired as I work to explore this tricky topic; please keep ’em coming!